The number of passengers using Eurostar has surged 19%, following the opening of one of the first UK sections of the high-speed rail link, the firm says. 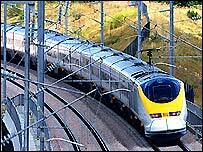 From January to June, over 3,400,000 people used Eurostar between London, Paris and Brussels, an increase of a fifth on the same period in 2003. Revenue for the period stood at £214m - up 16% on the same months last year - while 89% of trains arrived on time. Eurostar has been battling to take custom from cut-price airlines. The company has been keen to point out that journey times have been reduced as a result of the opening in September of the fast link between Folkestone and north Kent.